It seems that Vodafone Essar the number one GSM mobile service operator of Mumbai has finally accepted competition and come up with 2 new innovative offers. Vodafone launches ‘Unlimited SMS Pack’ and ‘Night Calling at 5p/minute’ for its GSM subscribers in Mumbai telecom circle. 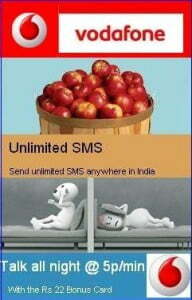 Now one can make Unlimited Local and National SMS with Bonus Recharge of 89 to any time any network across India. With this pack customer gets credits of 499 FREE SMS every day till 30 days from the date of recahrge hence first SMS of the day will be charged at Re1.This recharge is intended for consumer use and NOT commercial use hence there is a fair usage policy of 500 SMS per day. To avail this offer, one has to recharge with Rs.89 recharge voucher which is valid for 30 days. This offer can be clubbed with other prepaid tariff plans. Vodafone also introduces new Night Talk plan wherein its prepaid subscriber can Talk all night @ 5p/min by recharging with the Rs 22 Bonus Card. In this plan Vodafone users will get 450 minutes to local Vodafone mobile phone from 11pm to 8am.The minutes valid for 30 days and after 450 minutes subscriber will charge as per their current local tariff. i hav refilled the sms pack of rs.89 so y my balance is deducting…? ?